After weeks of keeping students at the edge of their seats wondering about their fate, the Delhi University cut-offs were finally declared on June 23. The subsequent minutes and hours would have been marked by celebrations and disappointments; of having just made the cut or falling short of it by the tiniest of figures. As expected, DU has kept up with past year trends in setting cut-off percentages at sky-high standards. While they did witness a slight decline from last year (between 0.25 to 2%), they did nothing to ease the pressure on the thousands of students who failed to score upwards of 95%. How do I decide which college is better for me? Should I give a preference to college or course? Should I take a seat in the colleges I am getting, or hold out for a better one? I was unable to make the cut, do I have no future? Well, we are here to resolve these issues and get your mind back at ease. So, let’s address these questions one-by-one. How Do I Choose Which College to Go For? This can be a tricky question, especially when the options you are getting are matched in terms of reputation and brand name. The choice between College A and College B has the potential to set the course of your next 3 years, so no wonder you are hard-pressed while making the decision. Here are a few pointers that can help. College reputation, although important, comes second to the course you would actually be studying. A college slightly lower in terms of reputation might actually be considered better for your target course. This would provide you with much better opportunities, exposure, and ultimately, skills and knowledge to take on the job market once you graduate. Thus, keep this factor in mind while deciding. Goes without saying, a quality faculty maketh the course. Unlike school where half of your time was spent attending tuitions to re-learn what was taught in class, what’s taught in a college classroom will make a difference to the level of your knowledge and understanding of concepts. Many college professors even take the effort to integrate different learning methods, such as classroom discussions, critical analysis of concepts, experiential learning, educational videos, etc. to help you learn better. Your teachers can actually make a world of a difference to what you take away from your 3 years of college. Your college life doesn’t just start and end at academics. The best part of the “DU-experience” is its emphasis on the extracurriculars that allows each student a chance to shine. There are hundreds of societies, sports clubs and events (such as college and department fests) available at each college, which you can be a part of. If you have a particular talent waiting to stand out, or one you wish to explore, you should definitely give this factor weight while deciding. Colleges have individual Facebook pages for different events and societies, where you can check out the activities of their members, and see which one clicks. We may choose to deny it, but what good is an education if it doesn’t get you a job? Placements form an important, if not the only, end-goal of your college life, and thus, they must be a part of the parameters you consider while making a choice. This is one area where your own research becomes essential. So, take the time to go through the college websites, facebook pages, LinkedIn, and talk to a few alumni to get a fair idea of the placement opportunities provided by the college. You’re going to be spending 3 whole years of your life at your college, so you need to be sure that it suits your personality. This is one factor that is much less quantifiable, but one, nonetheless, carrying a lot of weight. The ethos is the characteristic spirit of the college, its character, attitudes, vision, atmosphere and values. Colleges differ a lot in this regard. Say, an LSR would never be the same as an SRCC, right? Intellectual, relaxed, competitive or cordial, you decide which suits you best. What works for others might not work for you, and thus, the most important factor of all is your priorities. Do you want smaller batch sizes? Do you want to experience the campus life? Do you care about the infrastructure? Do you wish to be near to home or travel on a daily basis? Explore these and other questions when evaluating different colleges, and making the final choice. Now while exploring these factors and settling on a college, there is definitely one question that would be popping in your mind – does college matter more or the course? 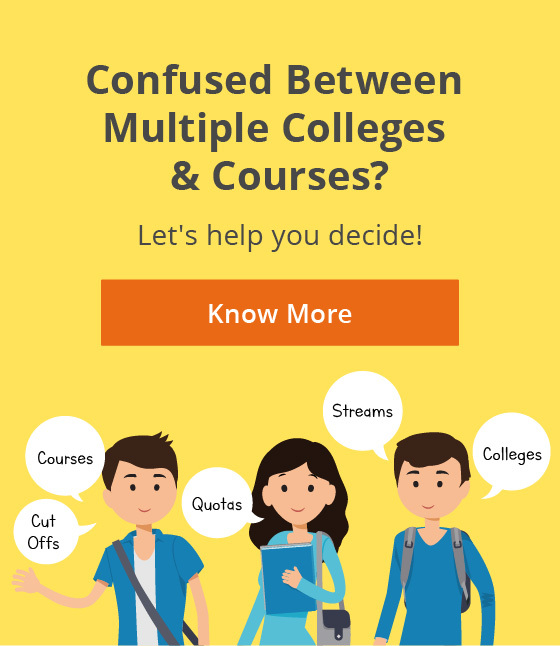 College or Course – How Do I Decide? …you know where your interest lies, and are passionate for it. Your aptitude and interest for a field are what is going to sail you to the end of the education sea and on to the island of job opportunities. It is a simple formula, if you like what you are studying, and have the skills for it, you would ultimately be motivated enough to excel at it. A job opportunity might come knocking at your door as a result of your college pedigree, but would never enter if you don’t have the skills and knowledge to show for it. An accomplished student from a mediocre college would always be preferred to an average student from a star college. Thus, if the opportunities and faculty of the college with your preferred course are good enough, you should follow the course-first approach. Also, compromising with a course that doesn’t match with the job roles you wish to get in after graduating (even if you have an interest in the subject), might not be the best idea. The type of job offers you get will be dependent on your areas of study, so even if you are choosing an alternative course at a better college, do factor in your ultimate career goals while making the decision. For example, a student aiming at honours in Psychology, settling for Sociology or a B.A Programme (with a major in Psychology) is still acceptable. On the other hand, a course in History and Political Science would just get him/her off track. ….you are not entirely sure, and are willing to explore. It’s understandable. Not everyone has it figured out, and it’s okay to experiment. If you are one who has an interest in several subjects, or are one who does not have an idea where it lies, taking the college-first approach might not be a bad idea. If you opt for a course with a wide range of opportunities, you will always have the option to zero-in on your interest during the 3 years, and specialise in the chosen field at the Master’s level. …the college options you are getting belong to two different worlds. Let’s be real. There are times when the opportunities and exposure you get in your college serve to enhance your profile and improve your access to job opportunities. The college atmosphere, experienced faculty, quality of classroom teaching, mentoring opportunities, and extra-curricular activities, all serve to enhance the college experience, and what one takes home from the 3 years spent there. Thus, if your choice is between an exceptional, top-ranking college and a mediocre one, you could let the college take home the cake for this one. Yet, if the same choice is between a mediocre and a tier-3 college, then again the course should stay on top. The course vs college debate is a tight-rope to walk on, one that requires a lot of balance, careful thought and consideration. Factor in the above-mentioned points before making the final decision. So, now you are much clearer on which course or college to target, but just missed the cut-off for it by a small margin. Should you wait it out for the next cut-off list? Do I Hold Out for the Next Cut-Off List or Take Admission in the Colleges in Hand? This is one question that a lot of students ask me, and one that should ideally not require any thought. You take admission now. In whichever college you are meeting the cut-off in. Remember the proverb our mothers/teachers taught us back when we were children, “A bird in the hand is always worth two in the bush”? The same applies here. You might be a star student, assuming that you can easily get in by the next cut-off list, just because you missed it by a small margin, but in life, there are no guarantees. The next cut-off might not even come out, and you could just end up with your third-best alternative, instead of your second one, all in the hope of cracking the first. DU has made no restrictions on withdrawing admissions in case you get a better college in a subsequent cut-off list, so you have the total freedom to switch your college in the next list. So, do not miss the cut because of unawareness/overconfidence, and lock in your options now, whatever they are. 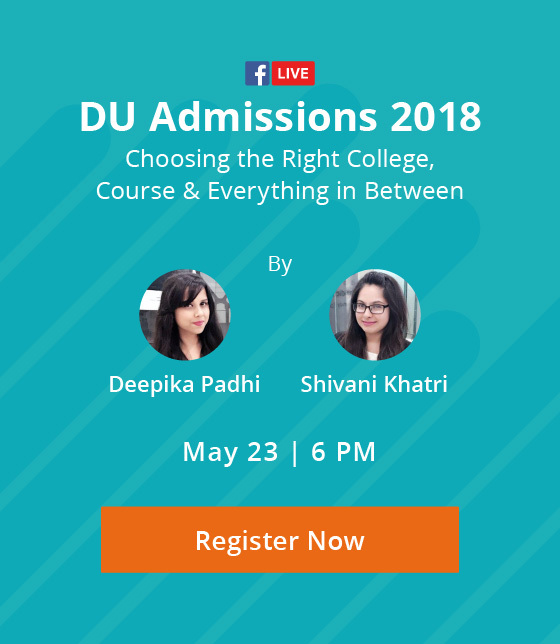 Now, all this is just as well, but what if you are unable to get into the college of your choice, or unable to get into DU at all, will your life be over? What Do I Do if I am Unable to Make the Cut? DU Admissions, much the same as life, may be full of disappointments and missed chances. With such sky-rocketing cut-offs and relentless competition, it is only natural that not all are able to meet up to them. The most important thing to remember here is that your marks, or inability to get into the college of your choice say nothing about your skills and abilities, and definitely do not put a stop to your career roadmap. If DU had been the only worthy university in India, the millions of students would just be sitting at home, unemployed. If your alma mater mattered so much, your resume would just be a white paper with your name and college written on it. Your college, although an important part of your profile, is just one part of it, not the whole picture. You can very easily make up for an average college on your resume by making your profile, knowledge and skills so strong that no employer will ever be able to say no to you. Starting from the three years of college life, going up to the two years of Master’s and higher education, you have 5 years to do multiple things to boost your profile and make it shine. These include, but are not limited to, taking up internships, social work, projects, co-curricular courses, languages, summer schools, student-exchange programs, etc. that would make your college name fade in comparison. Keep in mind that your course and college is as good as what you make of it. Now, choosing the right college and course definitely takes time and effort, so it is important not to rush, do your research, and take the advice of the right people in times of uncertainty. If you are still unsure and feel that you require further help in narrowing down from your options, and selecting the right one, we are here to help.